How can today’s medical schools truly prepare students to care for patients tomorrow? That’s the question Dr. Jesse Ehrenfeld said curriculum designers at America’s medical schools need to ask more often. The structure of medical education has changed little over the last hundred years, said Ehrenfeld, a physician and professor at Vanderbilt University. Students study the science of medicine for two years followed by two years of clinical experience. However, in an era when medical care is delivered largely by a team of providers, and when payment mechanisms and incentives are in constant flux, Ehrenfeld believes the old education model is no longer up to snuff. Yet this is exactly what physicians most need to know, said Ehrenfeld. He addressed a national conference of health journalists as a member of the American Medical Association’s Board of Trustees on April 9, 2016. For its first 150 years, the Chicago-based AMA was seen largely as a conservative organization devoted to maintaining the status quo for physicians. Over the past two decades, however, it has rebranded itself as a more progressive, advocacy-minded group. One of its recent initiatives is to modernize how physicians are educated, Ehrenfeld said. In 2013, the AMA granted eleven medical schools nationwide $1 million each to promote innovations in medical education curricula through AMA’s Accelerating Change in Medical Education consortium. Two years later, the consortium granted $75,000 each to 21 additional schools, including Emory University School of Medicine and Morehouse School of Medicine in Atlanta. Ehrenfeld said these educational best practices will be shared with non-member schools as well. “Our goal is to leave no one behind—to make sure that every medical student in this country is receiving the best [education] that they possibly can,” he said. 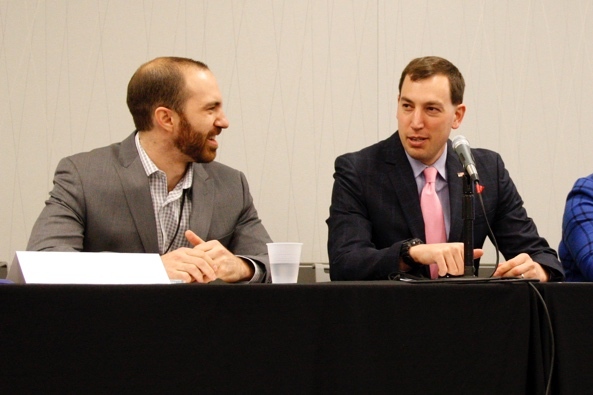 Also on the panel during the health journalism conference was Dr. Nathan Moore, a resident physician at Barnes-Jewish Hospital in St. Louis and 2013 graduate of the city’s Washington University School of Medicine. Moore wishes his medical-school professors had taught him more about how healthcare actually works in hospitals and clinics. While still in medical school, Moore and Elisabeth Askin, a classmate at Washington University, took matters into their own hands by researching and writing The Healthcare Handbook: A Clear and Concise Guide to the United States Healthcare System in 2012. The book is a user’s manual for navigating America’s healthcare system aimed at their peers. Moore and Askin published a second, updated edition in 2014. The handbook covers material that professors seldom touch on in medical school courses, Moore said, and it emphasizes the importance of integrated care: working in teams with other medical providers. A paperback book can’t address everything that Moore said needs to change, however. He would like to see medical schools emphasize healthcare systems factors, provide more of a focus on critical thinking and give students patient contact earlier in medical school. This time to appreciate you for taking the innovative steps in health education. Keep on to identify new things in educating the students about health and how to diagnose the health problems. If it possible, then share such great innovative things with us.